Tonight’s game is more about snapping out of poor habits than simply getting back into the win column. At times I feel as if I’m overstating how terribly the Sabres have played defensively this year. But then I watch the third period on Sunday or all of Saturday’s game and I realize that I’m just scratching the surface. This isn’t even something that is centered around one or two players, this is a team-wide epidemic of awful defensive hockey. Tyler Myers and Jordan Leopold have been lightning rods for criticism through the first nine games, and rightfully so. They’ve each had relatively poor outings that have probably peaked at average and bottomed out somewhere south of Rory Fitzpatrick in the 2006 Conference Finals. The rest of the defensive corps haven’t been immune as Christian Ehrhoff and Mike Weber have been the only two consistent performers thus far. The forwards have been equally horrible too as there has been little support in zone and many of the goals that have been generated off the counter-attack or rush opportunities have featured lazy stick checks from the forwards on Buffalo’s roster. Ottawa presents a test for the Sabres in that they have a deep lineup that features a few different lines that can produce. Add in a hot goaltender and this isn’t exactly a team a slumping squad wants to see. I will say that Boston provided the exact opposite test the Sabres needed last Thursday but Ryan Miller and Thomas Vanek responded with great games. 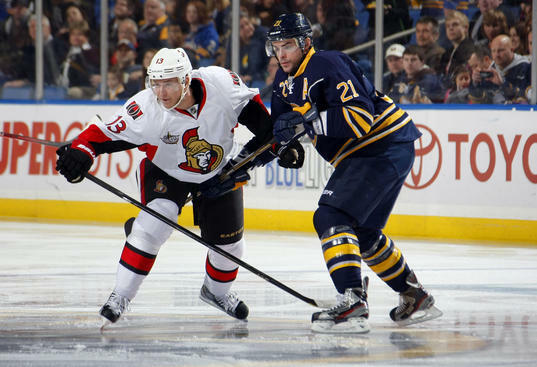 Perhaps a strong opponent like the Senators will give the Sabres the necessary push to get back on track. If the Sabres can produce goals with any other line that one with Thomas Vanek on it, things would probably get a little easier for the team. Tyler Ennis has had a few decent games and fellow center Mikhail Grigorenko has done the same. Steady production from those two plus any sign of life from Drew Stafford would be helpful for creating a viable second line. Ryan Miller’s recent body of work isn’t exactly spectacular. He’s been good, but his team is playing in a manner that he needs to basically be two goaltenders. If the Sabres can at least limit the golden chances they’re giving up and keep shots to the outside the onus will be more on Miller to play a simple game than dive around and try to make too much happen. He’s not strong when he’s trying to control too much (see Sunday’s loss). When he’s in control of his area and not worrying about backdoor chances, he is a much better goalie.